Two of Calderdale’s six rugby union clubs are in league action after all this weekend on what was set to be a blank day at the start of the Guinness Six Nations Championship. Old Brodleians and Old Crossleyans, who met at Woodhead last Saturday, have games against relegation-threatened sides which have been rearranged from December 15. 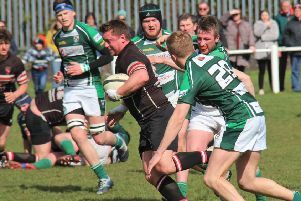 Brods, 24-13 winners last Saturday, host Hullensians while Crocs are away to Guisborough. Both host clubs are likely to make early pitch inspections due to the threat of frozen pitches with their visitors facing lengthy journeys. Brods are looking to extend their winning run to four, having conceded fewer turnovers and penalties at the breakdown in recent weeks. The defence has been good and a top four finish remains the target. Their visitors from Hull lost 47-0 to Beverley last weekend, having been 24-22 home victors over Old Rishworthians the week before in a basement battle. Brods coach Ollie Akroyd is hoping his side have put a poor December behind them. North Yorkshire outfit Guisborough have been struggling this season and it looks a good opportunity for the Broomfield men to resume winning ways but Crocs spokesman Howard Cooper is taking nothing for granted. He said: “Catch up weekends always seem to cause problems and this week is no exception with several players unavailable. However, I assume that most other clubs have similar issues. Looking back on last Saturday’s defeat at Old Brodleians, Cooper said: “Last Saturday for me was a case of one side taking their chances better than the other.